Disclosure: I got this product as part of an advertorial; I have not been compensated from the company for this review. This post contains affiliate links. I must say that I have been slacking when it comes to working out, exercise, and yoga for the last year. I lost my momentum and have not gotten it back until recently. Partly due to winning a month membership to Curves and because baby girl has been really excited about exercise. Given our family history I thought it would be good for both of us to do it together. 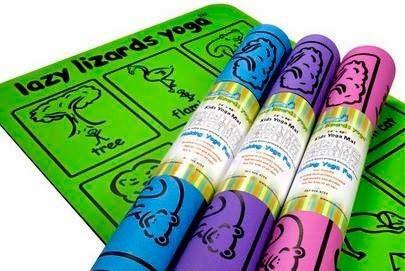 As I was browsing I noticed an opportunity for Lazy Lizards Yoga mats and it got me thinking - both kids enjoy yoga and thought this would be a great way to cultivate joy in exercise. As a bonus, the folks at Lazy Lizards are going to giveaway a yoga mat to one lucky winner. I picked the blue mat since both kids will be using it and waited to surprise them. When I handed it to Baby Girl she was so excited, she opened it while I started dinner and was doing the poses on the mat as best a four year old can and let me say - so freakin' cute! She has used it to do pushups with her dad, downward dog with me, and to eat pizza on it for movie night. Such a versatile mat! The mat sticks to the ground and gives really great traction for poses. If it was a little longer, I'd use it. Since I have amazon prime, I was able to find some easy to follow yoga videos, but there is a Lazy Lizards Yoga for KIDS! 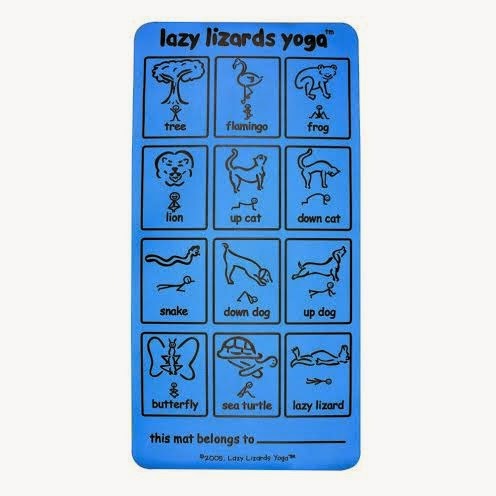 (Children's Yoga) available and you can also buy Lazy Lizards Yoga Kids Yoga Mats on amazon as well as on their website. This seems to be a mat that will hold up over time and it comes in really brilliant colors - the blue is so vibrant! We had a lot of fun practicing the poses together and we are looking forward to working out together.